Nissan remains the world's top-seller of electric vehicles, thanks to the Leaf. YOKOHAMA, Japan -- Nissan pledged to maintain its leadership in electric vehicles as the automaker outlined plans to launch eight new EVs and hit annual sales of one million electrified vehicles by 2022. Japan’s No. 2 carmaker said it will also bring 20 models with autonomous driving technology to 20 markets by then and reach 100 percent connectivity in all new Nissan and Infiniti models. The new targets flesh out the M.O.V.E to 2022 midterm plan unveiled by CEO Hiroto Saikawa last fall for the six years running through the fiscal year ending March 31, 2023. As part of the plan, Nissan wants to lift global annual revenue during the period to 16.5 trillion yen (C$202.0 billion), from the 12.8 trillion yen (C$157.0 billion) booked in the fiscal year that ended March 31, 2017. It also wants a sustainable operating profit margin of 8 percent. Chief Planning Officer Philippe Klein and other executives announced the product and technology components of the plan at a briefing on Friday at Nissan’s global headquarters here. Nissan’s growth strategy focuses on heavy investment in three pillars: electrification, autonomous driving and connectivity. 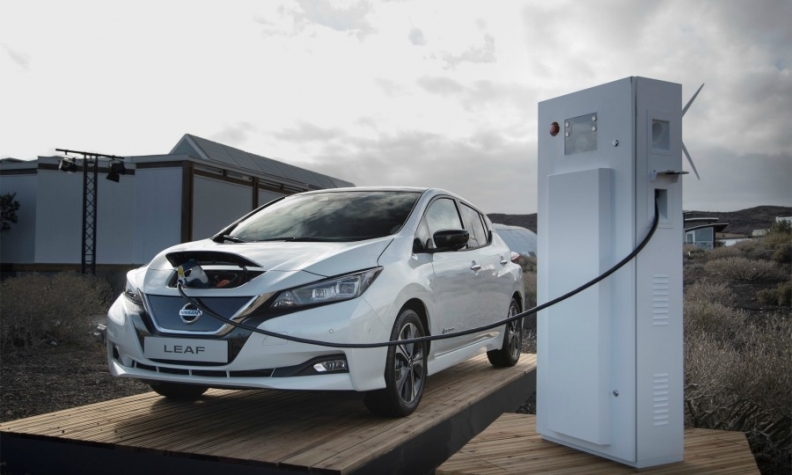 Bold electrification goals comprise the bulk of the new targets, as Nissan steps up its response to an onslaught of new entrants in the EV segment. Toyota Motor Corp., for example, said last fall it would launch 10 electric vehicles by the early 2020s and sell 5.5 million electrified vehicles, including hybrids and hydrogen fuel cell vehicles, by 2030. This month, Volkswagen AG said it will expand EV production to 16 factories worldwide by 2022 and make up to 3 million a year by 2025. For the time being, however, Nissan remains the world’s top-seller of electric vehicles, thanks to the Leaf EV it launched in 2010. It has sold more than 300,000 Leafs since then. Nissan’s sales goal of one million electrified vehicles by March 31, 2023, includes pure electrics and hybrids. The tally will get a boost from the introduction of Nissan’s new e-Power setup, a range-extender hybrid system it is already selling in Japan and will next bring to other markets. Sales of vehicles equipped with e-Power will account for more than half the total, Klein said. Infiniti will get its first electric vehicle in 2021, and about half of the luxury brand’s sales will be either full electric or e-Power by 2025, the company said. Electrification is expected to blossom quickly in Japan and Europe, and more slowly in the U.S. and China. But it will account for a much bigger slice of sales everywhere. In Japan and Europe, electrified vehicles will account for up to half of Nissan’s sales by 2025. In the U.S., they will account for between 20 percent to 30 percent; and in China, between 35 and 40 percent. The eight new EVs will come on top of Nissan’s current offerings, the Leaf and eNV200 van. One will be an all-electric crossover based on the iMX concept vehicle shown at last year’s Tokyo Motor Show. It will be a global vehicle and get autonomous driving technology. Japan will also get an electric minicar. Four of the new EVs will be directed at China, including a C-segment vehicle and a low-cost A-segment crossover and two derivatives for Nissan’s local entry-level brand Venucia. In autonomous driving, Nissan has made solid inroads with its ProPilot suite of advanced safety systems, which include lane tracing and emergency auto-braking features. Nissan offers the package on four nameplates, the Leaf, Rogue and Qashqai crossovers and Serena van. To date, It has sold about 110,000 vehicles equipped with ProPilot worldwide. By 2022, it will roll out the technology to 20 more models and target sales of one million vehicles a year. Nissan will launch the next-generation ProPilot system, which enables automatic lane-changing on highways, through a trial program in Japan within the next year. After that, the highway lane-changing system will be introduced to the new EV crossover and Infiniti models.